The Good Roads Movement began in the early 1900s as an effort to enhance the quality of rural life, allowing farm people to keep the benefits of rural life while having connections to markets and cultural possibilities of towns and cities and increasing economic investment and tourism. 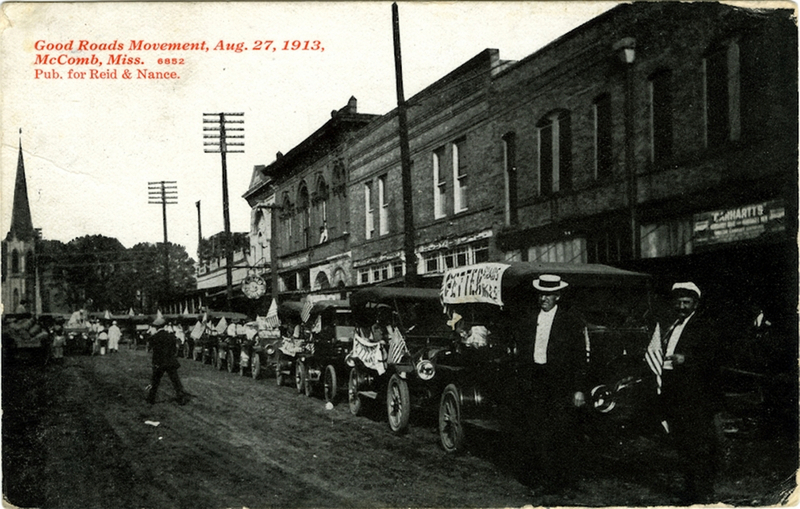 The movement sought to have hard-surfaced roads standardized under the direction of state authorities, thereby modernizing transportation to allow travel by car and truck. In the early twentieth century most Mississippi counties continued the antebellum practice of requiring all men to work a few days a year to build or improve roads. When county leaders announced Good Roads Days, they usually called on younger men to fill potholes with sand and dirt. Good Roads movement supporters, in contrast, wanted state authority over roads designated as state highways and wanted some new taxes to support building and improving those roads. The Illinois Central Railroad organized the state’s first Good Roads conference in 1901, but the movement progressed unevenly. Mississippi started its Highway Commission in 1916, in part because the Federal Aid to Roads Law of that year gave federal money only to states that had highway departments. The commission received limited funding until 1922, when the legislature inaugurated a one-cent tax on gasoline. In 1924 Mississippi designated its first state highways. In 1930 the state’s Stansel Highway Bill called for uniformity in state highways and a network of paved roads connecting all towns of at least five hundred people.